When it’s time to revamp your kitchen, there’s a lot of things that need to be considered. The cost, when to do it, what to put in your new kitchen etc. That’s why we’ve teamed up with the Essex based, kitchen designer, Roman Kitchens, to offer some helpful hints. Their passion? Kitchen design, and with over 20 years of experience in kitchen design, they know their stuff. Whilst you may not fancy yourself as a creative, when it comes to designing your new kitchen, leading kitchen designers at Roman Kitchens emphasise 4 main things you should focus on when you’re remodelling. Not referring to the vast cosmos above, Roman Kitchen’s stresses the space in your kitchen as one of the most important things to consider when redesigning. For many, the kitchen is more than just somewhere where you cook. It’s a meeting place in a home, where you stop and have a chat after a long day of work, and therefore, needs to have the space for whatever you use it for. Whilst you can over clutter your kitchen, the space refers to not only the placement of your units in the kitchen, but utilising cupboard and worktop space as well. Making sure your kitchen has essential appliances and enough cabinet space to fill your needs are just two things on Roman Kitchens’ checklist when designing kitchens with space in mind. Their handy checklist ensures that all their clients requirements, regarding space, are met. Your kitchen will always smell after cooking. The lingering odour of last night’s dinner however, is not a pleasant smell. If your kitchen isn’t properly ventilated, then those bad smells will just hang around like… well, like a bad smell. No one wants their kitchen to be greeted by the response ‘What’s that funny smell?’. That’s why the experts at Roman Kitchens emphasise to always ensure your kitchen has good ventilation. That means, windows within range and extractor fans. These can improve ventilation in the kitchen and make sure that yours isn’t labelled amongst visitors as, ‘the one that smells bad’. A well-lit kitchen is an essential. You want to be able to see after all… Lighting can make your kitchen feel more spacious and homely, transforming it from a cave-like hovel, to a beautiful, open and welcoming space – suitable for any occasion. 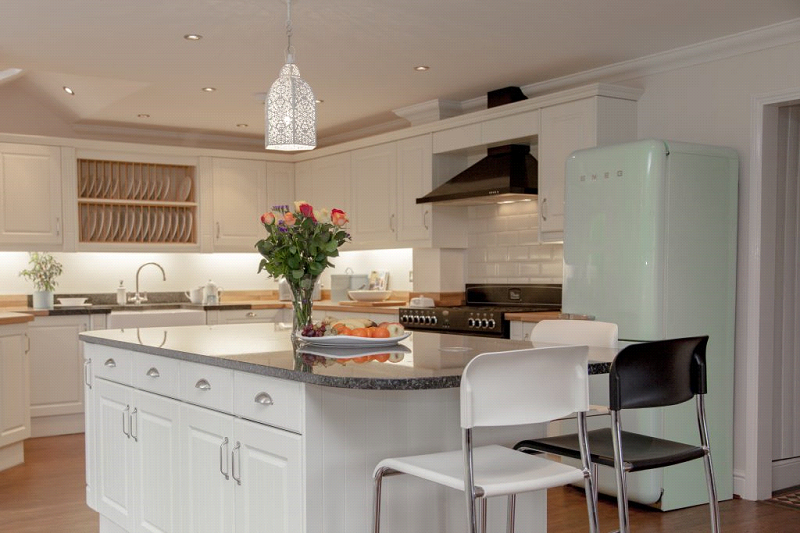 The experts at Roman Kitchens emphasise the importance of having a well-lit kitchen. They can fit lights that shine up, down – pretty much any direction to make your kitchen look beautifully bright and spacious. If you don’t consider all 3 of Roman Kitchens’ tips so far, you’ll end up with the equivalent of a cave – cramped, smelly and dim. The final tip that Roman Kitchens give is… always use experienced professionals. Whilst it might be slightly cheaper to try and go it alone, you’ll be sacrificing the quality and expertise, for the sake of a few pounds. Roman Kitchens use only the finest of quality materials and products when designing and fitting kitchens. One particular quality product Roman Kitchens stock is rotpunkt. A rotpunkt kitchen is the labour of German craftmanship, with a high-quality finish and beautifully sleek look. Roman Kitchens are one of the leading suppliers of rotpunkt kitchens in the UK. When designing your kitchen, always seek high-quality products and service. Never compromise quality when it comes to your kitchen. So, ask yourself, is it worth not going professional?